The house lies in a beautiful countryside, a few minute walk from the beach. A large garden and a swimming pool provide outdoor relaxation. A beautiful view of the sea and the close-by nature reserve ‘Lo Zingaro’ may be enjoyed from the balcony. A few hundred meters from the picturesque village of Scopello and the enchanting site of the Tonnara (old disused tuna-fishing station, now a bathers' resort), where some scenes from the film Ocean Twelve were shot. It is very quiet, but you can find all facilities, shops, bars and restaurants at a few kilometers distance. We are a family of three : my partner and I are both teachers, our daughter, Irene, is 15 and goes togrammar school. My family has had this house since the 80s. We bought it when this was still an unknown place, enchanted by the stunning location and the quiet. We live in Palermo, but we come here at least a few weeks every year in the summer and whenever we come it is for us a break from the noise and the stress of our daily life. We love the colours, which change according to the season, the silence, broken only by the singing of the birds and the sound of the waves from the nearby beach, the smells, a mixture of flowers from the garden and sea water. We could sit for hours just enjoying the peace and the view. Although located in a quiet area, away from the main road and the noise, the house is at a short distance from the village of Scopello and close to several restaurants, bars and pizza places. There is a supermarket, a grocery store and a vegetable market just 5 minutes by car and the town of Castellammare, offering all kinds of facilities, shops and entertainments, is at 15 minutes' drive. The beach is at few steps from the house and the beautiful reserve Lo Zingaro at 1 km. Besides the house lies just between the sea and the mountains, offering the chance of mountain walks to the trekking lovers. If you want to cool off and rest, you can just sunbathe and enjoy the pool, but if you want to keep in touch with work and home, bring your laptop along and connect to our wi/fi network. The house has a completely renovated bathroom with a large shower, sink, WC and bidet. Overlooking the sea with meals facilities. Occasionaly to be shared with the owners . Open from June to October. Notes on accommodation: Besides a highchair, also a cot and a changing board can be provided for babies and small children. Outside: There is a large solarium around the pool equipped with garden chairs, and umbrellas and overlooking the sea. The pool is private, about 7 x 5m. It is shared only if the owners are on the spot, occupying the other half of the villa. This can occur in the months of July and August. Pool heating is not necessary since up to October the water is warm. On the balcony overlooking the sea there is another table with chairs for outdoor meals, and two deckchairs. Utility Room: Ironing board and iron. Washing machine. Cleaning / Towels / Linen / Maid service: Towels and linen are included. The property is cleaned before arrival and after departure on a weekly basis. Great location, beautiful views from all around the villa. Extremely helpful owner, with lots of tips. Scopello is a delightful little town with restaurants and bars we had great food there, one lovely red giant prawns and tuna in La Tavernetta and a great value delicious meal in the Sicilian Street food bar in the square. Visited Erice very historic and again great food in the square, Segesta's beautiful Doric Villa and amphitheater. (Check opening times before going as it varies through out the year) Went to Palermo, bonkers driving in and around Palermo but found a multi-storey car park very reasonable parking rates, you can get the train in from Castellammare. Also went to Monreale very pretty, all these with in an hour or less of the Villa. The beach at the bottom of the road is stoney but lovely and like most of Sicily ruggedly scenic, the added bonus of the beach bar made it an early evening destination. There is the most amazing Deli supermarket on the road in to Scopello, the food so fresh and beautifully displayed, you can eat there and they do great gelato. The Villa is ideally placed to reach many great places and is nicely secluded. The swimming pool is an added bonus and the outside space is so varied you can always find a spot in or out of the sun. The wild life is mesmerising and we spent a lot of time watching the birds, insects and if you sit quietly enough at dusk you can see bats as well. The property was beautifully presented and in a lovely location with views of the sea. We enjoyed the peaceful location of the villa, and its beautiful views of the sea and Zingaro nature reserve. The pool, and the and balcony along one side of the property are elevated as the villa is built on a hillside, so on all but the hottest days there was a lovely cool breeze at the poolside and on the balcony. The pool was a good size, and very welcome for cooling down, with temperatures in the high 30s. The villa was well equipped and comfortable. Mariella and Giuseppe were very welcoming hosts, and speak excellent English. They gave us lots of useful information on the surrounding area and practical tips like where to find a supermarket,and recommendations for places to eat out including gelaterias! Villa D'Amico is in a great location, a short walk from least two beaches which are great for snorkelling, and a short walk from Scopello village with its cafes and restaurants. There's lots to see and do within easy reach of Scopello too, our favourites were the beach at Guidaloca, with it's pedalo slides and ringo/jet ski rides, the Temple and amphitheatre at Segesta, the caves at Mangiapane, with a village built in to them, and the stunning hill top town of Erice, near Trapani. It was too hot to walk to the beaches in the Zingaro reserve, but we took a boat and snorkelling trip to these beaches , which left from Scopello. The towns of Gibellina and Poggioreale, devastated by an earthquake in 1968, and their memorials were also fascinating, though beware the crumbling mountain roads! Many thanks to Mariella and Giuseppe for a great holiday. We would highly recommend this property and area of Sicily. A real gem of a find, close to everything you need but so idyllic and peaceful too. Perfect!! Excellent communication before, during & after our holiday. Clear directions from Palermo airport. 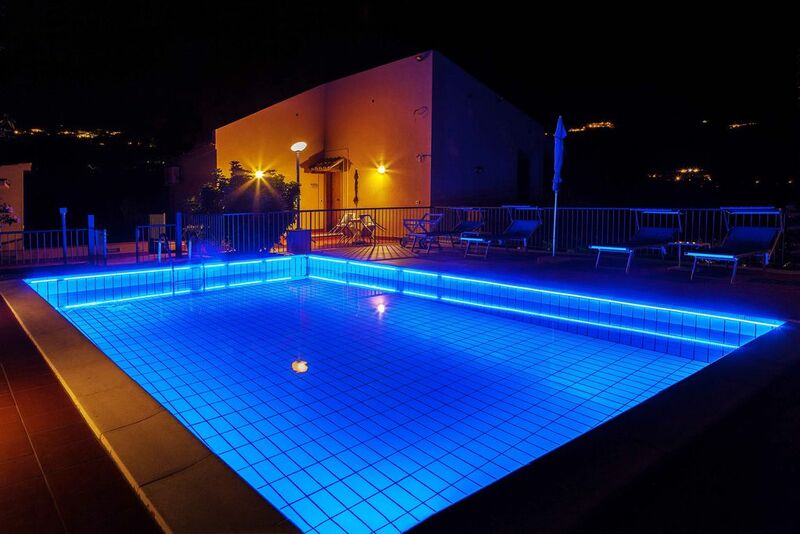 This villa benefits from a secure & well maintained pool, which was greatly appreciated in the hot weather. The villa contains all of the facilities required for one week's holiday. Although a combi microwave is available & not a separate oven / microwave as implied on the website. The owners are friendly & any queries were efficiently dealt with. We visited Erice, Segesta, Selinunto, Agrigento & Palermo - the temples were amazing (Segesta & Agrigento temples - for us were the best). The botanical gardens in Palermo are well worth a visit, as relaxing & containing some spectular plants. Unfortunately Palermo palace was closed during our visit. We would certainly recomend this villa. Thank you. This is a good place for a holiday in an stunning setting. It’s an easy drive from Palermo (nb. If you are picking up a car from Palermo airport, you can walk to the car hire area, no need for shuttle) and we were sent very clear directions. The views are incredible. It feels very private and peaceful, although we did get some loud late night music from the apartment down the hill a couple of times. The pool is beautiful and ideally situated. It is a very short drive to Scopello (albeit down a terribly bumpy road), which is a very atmospheric and beautiful village. Scopello also has an ATM. There is lots of incredible outdoor space with terraces on two sides of the property. We ate every single meal outside for two weeks. The kitchen/living room is a smallish room so might start to feel cramped if it was not warm enough to eat every meal on the terrace (the bedrooms are perfectly spacious however). Also worth noting that there is no proper oven (although there is a microwave oven), and no DVD player, which might be of interest if you have kids. We had a couple of problems with the gas hob not lighting but the owner very promptly sent someone to fix it. However, we will definitely not be returning to this property because we found the fixed cleaning charge, on top of which 50% again was then deducted from our deposit, to be excessive. We have stayed in countless rental properties as a family before and have never had any issues, but in this case the owner contacted us in a very abrupt manner shortly after our return to the UK informing us that she was unhappy with how we had left the apartment (because of things like some sand that had been brought in on small feet, and empty bottles which we had left lined up by the kitchen bin – there are no outside bins or recycling facilities on site). We were disappointed as we had done our best to keep the property in a good state during our two week stay, using the mop/broom that were provided, but without a vacuum cleaner it would have been difficult not to leave any sand when we were on the beach every day. Obviously the owner is understandably concerned with the maintenance of her property, but if like us you have small children, you might want to note that she expects you to leave it in a state that in our view does not take account of normal wear & tear, certainly for a 2 week stay, and you might end up paying considerably more for cleaning from your deposit on top of the basic fee. I've had plenty of families with children in the last years and nobody has ever left the house the way you did.I never had to deduct money from the deposit to cover extra cleaning expenses before. The house was filthy. I have photos taken from the maids of dozens of bottles, grease on the kitchen surface and so on. The pool area and the easy chairs were full of mud. I understand why you signed yourself anonymous. As regards the living room being small on cold days, I'd be surprised there were cold days in Sicily from April to October. I also wonder who wants to be indoors watching videos when there's a pool, a solarium, a garden and a beach just outside, not to mention all the places of interest in the area. The holiday was a surprise birthday present for my wife and we had a blissful week in paradise. The photos do not do the location justice. The views from the balcony down to the sea or from the spacious swimming pool area are truly breathtaking. The villa was clean and well equipped and everything was so well organised for us in advance. The owner could not have been more helpful. The walk down to the beach is a couple of minutes and Scopello is just up the road and it is a picturesque village with great restaurants and a relaxed atmosphere. It is also a great location to explore the area and the nature reserve. We could not have been happier and would recommend this to anyone looking for a stunning, secluded location - a romantic retreat to enjoy Sicily. 5 star all the way. Pebble beaches at 3 minutes' walk.One has a bar, toilets and offers boat and canoe rental during the summer. Sandy beaches can be reached by car (15 mins to Castellammare and Alcamo beach.) The beautiful sandy beach of San Vito Lo Capo can be reached by a 50 mins drive.Guidaloca, 5 minutes by car, is a pebble beach with umbrellas, sun beds, bar service. Lo Zingaro reserve has stunning little coves with crystal clear water. From Castellammare port daily boats stop at the best beaches. Palermo and Trapani airports are at about 30 minutes drive from the house (Scopello is half way between the two). Although a bus service to Scopello is available and Castellammare can be reached both by train and bus, it is strongly advisable to have a car since the house is distant from the main road and from the bus station. Besides the public connections are not very frequent. Mini golf 5 min drive, Lo Zingaro natural reserve 3 min drive. Greek archaeological site of Segesta (temple and theatre) 30 mins drive, summer performances held at the Greek theatre. Medieval mountain town of Erice 40 mins drive. Beautiful sandy beaches in Castellammare del Golfo and Alcamo, 15 mins drive. Picturesque beach resort of San Vito Lo Capo 40 mins drive. Trapani salt-pits 45 mins drive. Archaeological site of Mothia Island one hour drive. Palermo 45 minutes drive. In the nearby village of Scopello you can find an automatic teller, a first aid station, a grocery store, a fruit and vegetable stall, a bakery, three bars, pizza places and restaurants, ceramics and clothes shops, a church a tobacconist, a scuba dive center. At two kilometres from the house on the way to Castellammare there is a supermarket, a greengrocer's and a newsagent. In Castellammare you can find banks, post offices, shops, hairdressers, pharmacies and all kind of facilities. Booking Notes: 50% of the rent is required to complete the booking, to be sent by bank transfer; the remaining 50% is to be settled cash upon arrival. A refundable security/damage deposit of 250 is required. If you cancel there is no refund unless the unit is re-rented. Changeover Day: Changeover day is Saturday. Arrival should be not before 2 pm. Departure by 10 am. Different arrangements can be negotiated in special cases. Notes on prices: Prices are for the property per week in euro. They cover pool maintenance , gardening expenses, gas, water, linen, bathroom towels and beach/pool towels and final cleaning. Electric consumption is included up to 100 kw per week. Extras will be charged at 0.5 euros per KW. A 10% discount is offered on payments by bank transfer. A refundable security/damage deposit of 200 is required.